Traveling with Tracy to Emory Winship Hospital! I wanted to give everyone an update on the ELK Studio – From the Heart Winter event! I had a fabulous time with Tracy delivering our beautiful hats to Emory Winship Hospital in Atlanta, Georgia. I asked Tracy if she would be interested in telling her story of what it meant to her to join the event. “Back in Jan I turned 50, having spent the previous few months feeling down and overwhelmed I decided to treat myself to some ME TIME. That translated into making a trip to Yarnhouse in Opelika, Alabama to meet Kathy Lashley and other members of the ELK Studio group for an afternoon of crochet and chatting. This was a fun-filled afternoon that was refreshing and energizing. During the course of the afternoon I shared with the group that my mother and my best friend were both battling cancer, and I was working to make hats for both infusion centers. Kathy offered to let me host the upcoming From the Heart event. I accepted. This turned out to be the best thing that I have done for myself in a long time. Kathy posted the event and the hats began to show up at my house. After long days at work I would come home exhausted and defeated. I would check the mail and find packages from members of the group. My depression and anxiety melted away as I discovered gorgeous hand-made hats from members who were giving their time and talent to comfort people they would never meet. It renewed me and renewed my faith in people. On Wed March 16, Kathy and I rode to Atlanta and delivered half of the 150 hats, scarfs and headwraps to Emory Winship where my mother is currently receiveing a stem cell transplant. We arrived unannounced and were received with a huge smile from DaVida Lee-Williams, the director of Guest and Volunteer Services. DaVida’s warm smile and caring spirit lifted my spirits and confirmed that I had made the right decision by accepting Kathy’s offer to allow me to host this event. I want to thank everyone that made this possible. Your help with making hats for these two infusion centers helped me to achieve a goal that I would not have been able to accomplish alone. I want to thank Tracy for helping me make this event so successful! I hope you’ll join us for our next upcoming event. Stay tuned for details soon! I’ve written many blog posts over the last year or so with most of them containing free patterns. I love that I can share these patterns with all of you and hope you’ve enjoyed them, but this blog post is probably the most meaningful one I’ve written or may ever write. You see, yesterday I received a very important and special letter from a gentleman from California. He didn’t have to write me. I would have never known any different if he hadn’t…..but he did. Every month my ELK Studio – From the Heart charity chooses different organizations where we will send hats, scarves, mittens, etc. In the month of April we chose Crochet for Cancer, the San Francisco chapter where cancer patients received our hats. When I decided to start my charity organization, I spoke with the women in my ELK Studio crocheters Facebook group. Many of them joined me and have been faithful to give every month. I can’t tell you what it means to me to have the privilege to give back but instead let me show you why we do what we do. My heart is over-filled with joy and talk about a humbling experience. If I’ve ever wanted anything to go viral, it would be this letter from a man fighting for his life but still took the time to say thanks. (So share everywhere!) What a testimony to his character and he truly is someone special. I pray he receives his miracle of healing. I want the world to know that YOU can make a difference in the life of a person. It only takes a small act of kindness too. 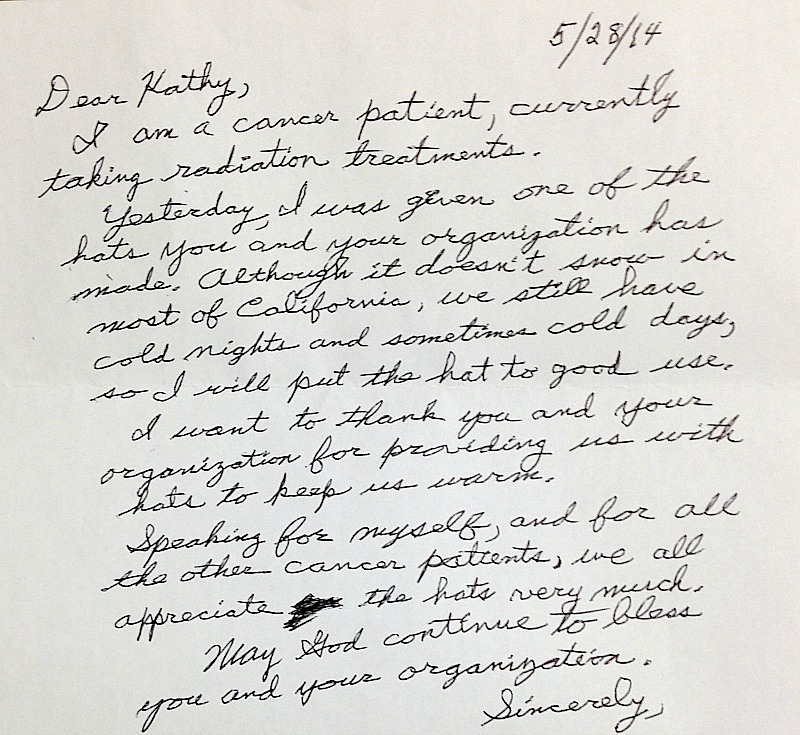 I told Tracy, the co-founder of Crochet for Cancer, yesterday about the letter. I love something she said and want to share it with you. “I think it’s the compassion behind the cap that makes such an impact in someone’s journey.” Those word couldn’t be more true! If you’ve never given, do it! It doesn’t have to be my charity but any local organization within your community. You’ll be glad you did.